Ever wondered why most Koreans have a shiny sparkling spotless skin and you don’t? You may wonder does it come naturally or are they really putting too much makeup on? What is it that your moisturizer, primer or foundation lacks but the product they use don’t? When Mary Louise of Santa Monica first heard about the Korean BB cream, her first impression was just as similar as of many beta testers of the product! “Oh, wow! Another concealer look alike foundation” *sigh*. However, once she used it, she realized that the results far outweighed her expectations. “How is it possible?” and she was compelled to perform a more in depth and thorough research on these Korean made BB creams. She learned that a BB cream is not just a cream, but a quadrupled action pack and a multi-functional super cream. It promises sun protection, moisturizing, color-correction, blemish removals, minimization of pores and much more. BB Creams, originally manufactured in Germany, were initially launched and distributed across the market as a beta testing product. Realizing the expansively increasing benefits of its usage, dermatologists started recommending it to patients who were downright frustrated with skin problems. In time, the product gained considerable popularity. Apparently, Korea took pride in perfecting the product to supreme flawlessness. They used some of the best raw materials to optimize the core features of the cream. These may include anti-aging chemicals, skin brightening extracts, moisturizing extracts and sunscreen chemicals within the product. Korean women popularized the BB cream as an alternative to foundation because they were looking for a product that would provide coverage while having a variety of skin-benefiting properties,” advocates Charlotte Cho, CEO of online Korean beauty shop, Soko Glam. Gaining immense fame in such a short span of time, BB cream made its way to some of the top cosmetic podiums and drug forums across the world. But, what to buy!? Can I find the product for my specific skin type and atmospheric conditions around me… And that’s exactly why I am here. Take out some time to read our interesting article on some of the top reliable BB creams on the market. So, without further Ado, let’s delve in. Is Korean BB Cream suitable for my skin type? What are some of the main ingredients of a MISSHA Korean BB Cream? Topping our list today is none other than the emblem of BB Creams itself, MISSHA M Perfect Cover BB Cream. As the name suggests, this 50ml tube is a perfect solution for all skin types. It is just the cream you require to become the next cover girl of SHE magazine. With MISSHA, you not only get a skin-protectant but it also adds anti-aging effects to your skin. MISSHA BB Cream contains ingredients such as Hyaluronic Acid, Ceramide content and Gatuline RC which promises long lasting elasticity and adds moisture to the skin. The cream contains extracts of Rosemary and Chamomile which soothe your skin and add a natural soft tone to it. You may wonder is it possible that you can regain back your youth and live in the 20s? Well, with MISSHA M Perfect Cover, you sure can. For best results, apply it after your basic skin care treatment. To apply, simply give the cream a gentle rub evenly across your face. For best results, finish off with a powder application. Unlike many other similar products, MISSHA includes the right mix of natural ingredients. It acts as your moisturizer, foundation, primer & sunblock all at the same time. It hides skin discoloration and removes blemishes, dark spots, acne, etc. Anti-aging elements regenerate new skin molecules and removes the dead one. This cream contains healing capabilities and keep skin evenly toned and smooth. It contains UV protection which protects your skin from harmful rays of the sun. The most problematic issue that circulates the mind of many is whether the cream is best for all skin type as it claims. Therefore, our team took time and effort to ensure this and performed a thorough quantitative analysis in order to ensure that MISSHA BB Cream fits best to it claims or not. As far as the response is concerned, it turned out to be pretty interesting. More than 80% of the testers returned back with a positive review on the product. This natural product contains extracts from bearberry plants. They have amazing bleaching properties. And the most active ingredient in the cream is arbutin which prevents the skin from darkening. Both of these ingredients work on all skin types and that’s why BB creams are one of the best products to utilize. A normal BB cream contains natural extracts from different botanical gardens. These may include herbs, fruits and flower extracts. 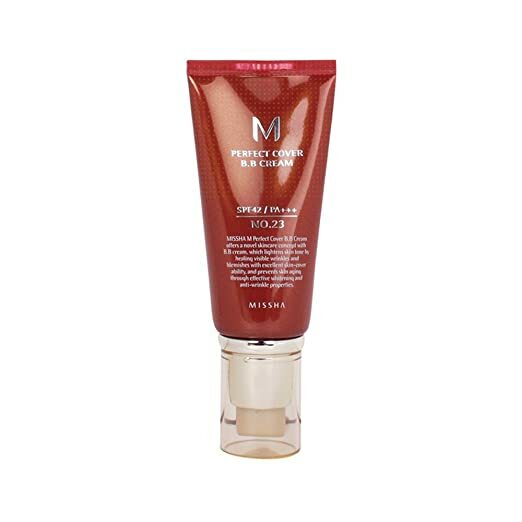 In case of MISSHA Perfect Cover BB cream, it further adds hyaluronic acid and ceramide content to natural extracts. It also contains arbutin to control skin darkening and adenosine to restore damaged skin. All ingredients used in the product are synthesized, tried and tested under strict pharmaceutical guidelines in FDA certified environments. Having trouble getting rid of red spots on your skin? Koreans believe that Tea Tree Oil can help you remove them completely. To achieve that, they created a perfect pore clearing skin solution. 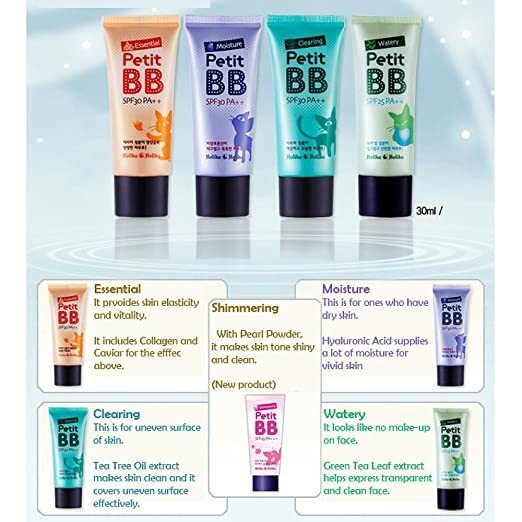 Holika Pore Clearing Petit BB cream is one of its kind. It contains tea tree oil extracts along with sebum control powder. The amalgamation of both ingredients give your skin a baby soft tone and a refreshing feel. Terpinen-4 is the core ingredient in Tea Tree Oil which reduces inflammation of the skin. On the other hand, Sebum control powder ensures that your skin remain soft and conditioned. As far as the concern lies, what makes this product so attractive for most customers? It is the minimal odor of tea tree oil in it which is basically the active ingredient of the cream. If you have one of these on your cosmetic shelves, then consider yourself as the few lucky ones. This limited SPF 30 cream is a triple action solution which helps maintain your skin complexion at its best. It gives your skin a natural tone and texture and smooths out uneven skin patches. It also adds a veil to it so the skin is safe from moisture. The secret ingredient which makes the product rich in nutrition is Gold and Caviar extracts. Both of these ingredients control skin damage caused due to high UV exposures. The cream also contains rich minerals such as Phyto Collagen Liposome and Borago Officinalis Seed Oil. They keep the skin rich, bright and moist and minimize dryness factor. The cream outstands many similar products on the market because it contains argania spinosa, a certified Ecocert protect. Argania spinosa conditions the skin and keep it safe from all harmful impurities. 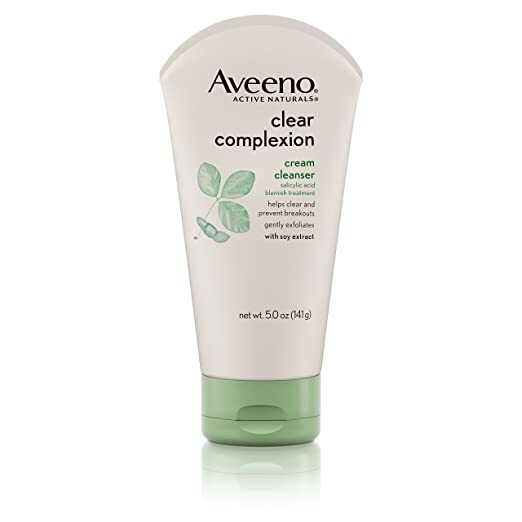 Not many creams have the capability to get rid of all your skin problems, but Aveeno Clear Complexion is indeed a pioneering solution for all your cleansing needs. This agent contains soy extracts and skin exfoliating micro-beads which improves your skin tone and texture. It also contains Salicylic acid and other active natural ingredients which remove blemishes from the surface of the skin and keep it hydrated. The product is good for such skins that are vulnerable to skin breakouts or over-drying. It is an oil-free solution which contains hypoallergenic, non-comedogenic and non irritating ingredients ensuring an everlasting fresh skin. With Aveeno’s incredible cream formula, put aside your concerns of pore clogging. Now, have a fresh and smooth skin tone with long lasting results. Maybelline itself is a reliable name on the market. Therefore, it is a hard chance that this product would likely fail to meet customer expectations. The cream contains a special formula that adds beauty benefits to your skin in 8 different ways. It removes all imperfections and add hydration layers to the skin which gives it a perfectly natural aura. It also removes the oily elements and other heavy impurities that are constantly damaging the face. 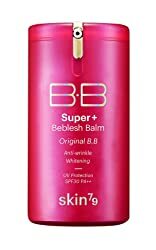 Compared to older versions of the skincare solution, the new Skin79 Super BB Cream (Pink Label) is the perfect tube to give your skin an everlasting pinkish glow. It is a triple action natural skin toner which provides excessive care to prevent greasiness and skin darkening. The cream contains astringent maximowiczia which minimizes sebum on the skin. The pink blooming formula is what sets the tone and texture of the skin. The cream further includes Bromelin a strong fighting component against darkening of the skin tone. Elements of Sepicalm S helps in adding a soothing effect to the skin. The cream also contains Vitamin C and acerola extracts to add an extra layer of clean and bright complexion. With the application of Pink Label BB Cream, you can wave off your stressful skin days once and for all. If you are looking for a reliable brand on the market for face Moisturizer and Anti-Aging, then Garnier is one such brand where you can put your faith in. Garnier Active Face Moisturizer & Anti-Aging BB Cream is the perfect skin care product that allows you to combat all signs of aging. It gives your skin the perfect look and feel by reducing wrinkles and giving it a more firm look. The core ingredients used in this BB Cream is pro-xylane antioxidant apricot extracts & tinted pigmentation minerals and they give similar results as that of any other SPF 15 BB cream. With Garnier Skin Active Face Moisturizer, you get even skin tone, smoother and a healthier skin glow. The cream also deeply hydrates your skin and prevents the skin from having sun-burn. Lioele Beyond The Solution BB Cream takes your skincare game a step ahead than any other normal skincare products available on the market shelves. Interestingly, this product not only suppresses the imperfection within your skin, it also gives your skin a natural cover and a complete make-over. So, if you are planning to hit a party the other night, this cream should be a priority product on your list of makeover cosmetics. The active ingredients in Lioele BB Cream are bisabolol, licorice acid derivatives, allantoin components, jojoba oil, macadamia nut oil, hyaluronic acid and marine collagen. All these ingredients add a soothe and smooth effect to your skin. Also, the product is a perfect moisturizer and does not require any base or foundation. If you want a speedy make up solution for yourself, then Lioele Beyond The Solution BB Cream is the right product for you. It is non irritable and adds a soothe effect. 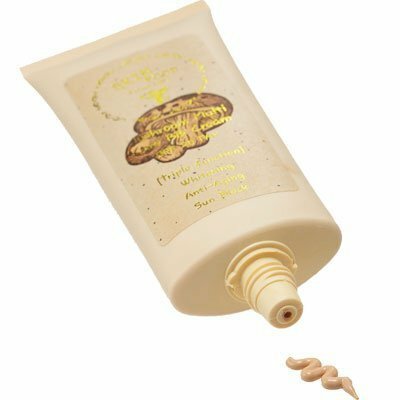 Another best triple action BB cream on the market is Skinfood mushroom multi care BB cream. It is a high functioning SPF 20+ cream which allows the skin to not only retain its glow but also add exceptionally smooth tone and texture to it. The cream contains active ingredients such as adenosine and arbutin. Both of them equally contributes in improving skin tone and facial firmness. The cream contains anti-aging ingredients which remove all wrinkles and also keeps the skin well protected from the harmful rays of the sun. Searching the secret of having a flawless skin tone? Well look no further… L’oreal Paris Magic Skin Beautifier BB cream gives your skin a light coverage and a desirable skin tone. This cream is not just any other beautification cream, it contains beads and pigment capsules infused with Vitamins. The cream works on your skin in four different ways. It acts as a primer to smooth up your skin and add texture to it. It hydrates your skin and acts as the perfect moisturizer. It hides all blemishes from your skin and make it stunningly beautiful. Last but not the least, it gives your skin an outclass finish and make it look beautiful than ever before. If you haven’t tried this product yet, take the chance and make the most out of it.